We are very particular about our LED production philosophy of recreate the light quality, brightness, image, and the atmosphere provided by traditional lamps. the shape and the size remain largely intact. 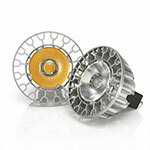 Our products offer high compatibility in the true sense that they can be used on existing lighting fixture as is. 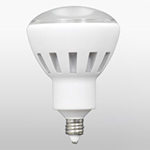 A 12V, MR16 LED lamp. Suited to exchange from a MR16 halogen lamp. 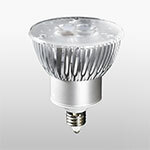 A 100V, MR16 LED lamp. Suited to exchange from a MR16 halogen lamp. An LED lamp. 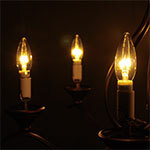 Suited to exchange from a R40 incandescent light lamp. Let is an LED lamp that duplicates the filament of an incandescent lamp utilizing 3D mounting method.It recreates faithfully light diffusion, impression, shape, and size.